Only $138.00 Auto Pet Waterer - Large 083497500109 2000LW Ergo Systems Inc.
Auto Pet Waterer automatically supplies your pets with sparkling crystal clear fresh water through a unique 8 layered filter. The automatic forced aeration system reduces pet saliva contamination and also guarantees algae free water. This reduces the chances of your pet getting urinary tract diseases, kidney and liver problems. Also keeps pets well hydrated and healthy. 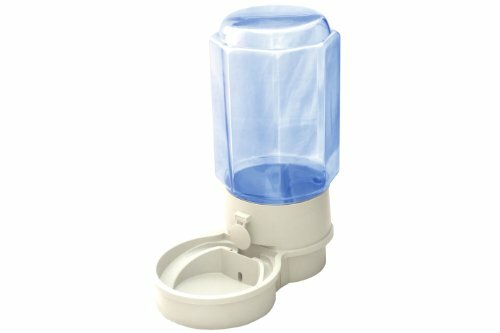 The pet waterer has a unique eight stage filtration system with activated carbon that guarantees clean, odor free and algae free water specifically designed to meet the convenience of pet owners while preserving their pet's health. The Pet Waterer encourages your pets to drink more water, thus preventing them from getting Urinary tract infection or kidney and liver failure. The replaceable eight layer water filters are inexpensive.